Believe it or not this was a celebration of our tenth year of adventure here at Expedition Class. To celebrate we tackled something that scares us witless. Climbing way up into really big trees. 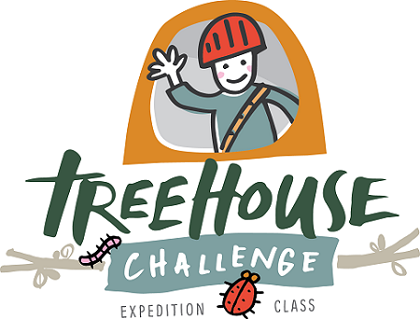 The Tree House Challenge explored forest types and what makes them different and special by climbing the trees that grow in them. In Australia we have three main forest types - dry eucalypt, wet eucalypt and rainforest. Our task was to zip around Tasmania looking for each forest type and then picking out an iconic tree in each one to climb and stay if for a night or two... in a TREE HOUSE. The journey was live and broadcast straight into classrooms from 7th August to 1st September 2017. You can relive the adventure day by day anytime through the video, photographic and written updates. During the expedition, students joined discussions with scientists and other experts to gain a better understanding of the things we find along the way. The discussion boards are now closed for new contributions but they are a wonderful resource to revisit. Especially where our experts added comments and answered questions from students. We worked with the Forest Education Foundation to give you free lessons to use before, during and after the expedition. They are Australian Curriculum aligned and perfect for all primary school levels from Year's 1-6 We'll explore areas in science, geography, English, art and ICT. You can do as little or as much as you like. These are free and available to everyone.